Folsom short sales as well as foreclosure activity in Folsom are increasing. For the fourth straight month, Short Sales going pending have increased month over month. 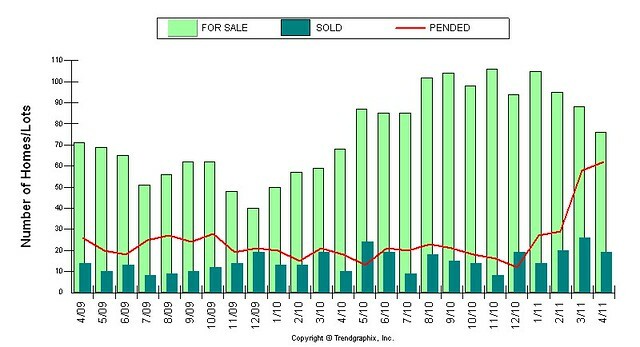 Closed short sales are still struggling though… the gap between the number of pending sort sales and closed short sales in Folsom is widening, instead of narrowing. The number of notice of defaults and notices of trustee sales in Folsom are increasing again after a lul in December and January. I find it very interesting that at the same time that short sales in Folsom are increasing, the actual number of foreclosure sales (homes going back to the bank) are staying quite stable (red line below) . This entry was posted on Friday, May 13th, 2011 at 1:25 pm	and is filed under Sacramento Short Sale and Sacramento Foreclosure News. You can follow any responses to this entry through the RSS 2.0 feed. Both comments and pings are currently closed.